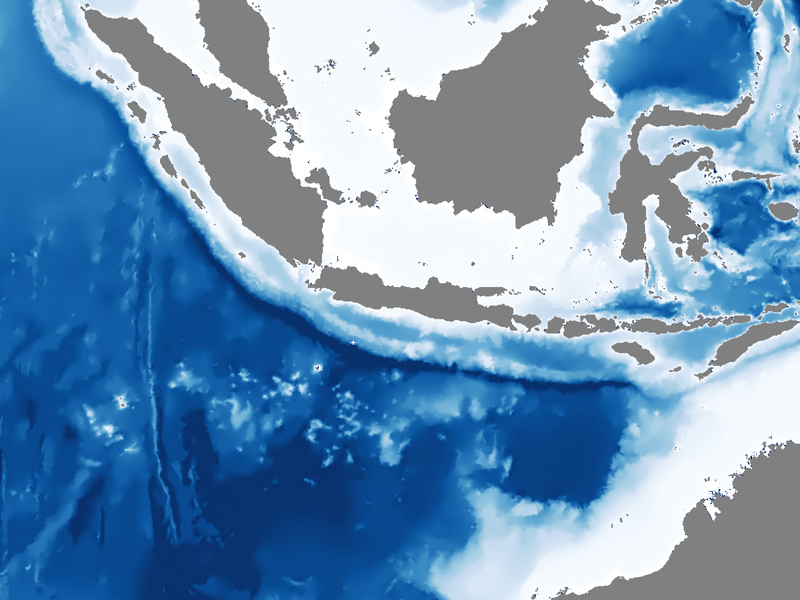 At 5:07 p.m. local time on July 17, 2006, a tsunami struck the Indonesian island of Java. Bringing water approximately 2 meters (6 feet) high, the tsunami destroyed buildings and damaged fishing boats. According to Reuters news service, at least 80 people had been killed. The tsunami resulted from a nearby earthquake. Estimates for the quake’s severity ranged from 6.8 to 7.7 on the Richter scale. This image shows the region’s bathymetry. Just as a topographic map shows the height of land surface features above sea level, bathymetry shows the depth below sea level. In this image, darker blue corresponds with greater depth. The water is shallowest closest to the islands, getting considerably deeper east of Borneo, and south of Java and Sumatra. The epicenter of the earthquake is approximately 250 kilometers off the coast of Java. 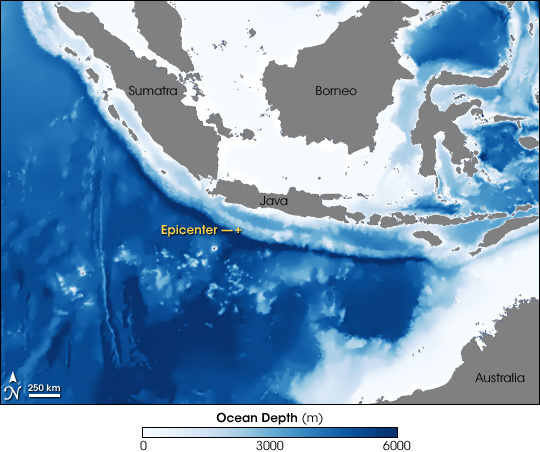 Marked in yellow, the epicenter appears along a ridge where the ocean floor rises fairly abruptly from greater depths. Flat gray areas indicate landmasses. According to News@Nature.com, Java received an alert from the newly installed tsunami early warning system, and this might have saved some lives. Other news sources speculated that memories of the severe tsunami on December 26, 2004, might have spurred locals to seek higher ground as soon as they felt the first tremor. Hours after the tsunami struck, however, the number of casualties remained unknown. 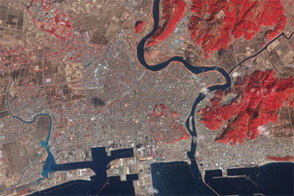 NASA image by Jesse Allen, Earth Observatory, using data from the Blue Marble.